As a writer, Gertrude Stein is one odd duck. As a person, she has her champions and her detractors. But there have been literally countless problematic old white men playwrights with weird plays that we still insist on doing, so as just the most meager of counterbalances, it’s nice to see Ms. Stein hanging in there are part of the theatrical canon, refusing to go quietly. And it’s good to see a company like Theatre Unbound taking her on and making something incredibly Fringe-worthy out of the process. Theatre Unbound has taken Stein’s script Turkey and Bones and Eating and We Liked It, and under the direction of JK Phillips and Melissa J. Simmons, and the dramaturgical guidance of Executive Director and resident playwright Anne Bertram, the acting ensemble has devised A Gertrude Stein Christmas. Stein’s works are open to wildly different interpretations, you just need to make sure you get all the words right and then within that framework you’re free to play. And play they do. There’s not just spaces between the words and meaning, there’s spaces between realistic props and furniture, and mimed items and activity. The scenario they’ve hung on the skeletal frame of Stein’s words is a very modern family Christmas. Maud (Delta Rae Giordano), the family matriarch is suffering from dementia, and it tends to find her upending family gatherings, reacting to people strangely, and wandering off if she’s not watched. Eldest daughter Henrietta (Laura Wiebers) copes by quips and drinking. Middle child Genevieve (Alexandra Gould) bears much of the load of keeping the household moving forward. Youngest daughter Susan (Jasmine Porter) has decided Christmas is the perfect time to introduce her new girlfriend Mary (Stephanie Ruas) into the mix. Family shorthand, English as a second language issues, and Maud’s fractured personal vocabulary all make for very unconventional conversations (and holiday song lyrics). The challenge for everyone is to find a common language to communicate with one another not just verbally but emotionally. 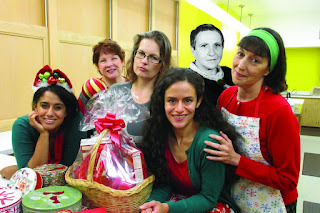 An aborted elaborate meal, random Christmas decorations, and an escalating snowball fight all help contribute to breaking down the walls between these five women, and bringing them together before the lights fade out. It’s not an uncomplicated family. But whose family is? It’s not so much a happy ending as it is a realistically hopeful one. We got through another day, together. At holiday time, or anytime, as a family unit, isn’t that better than most folks can hope for? I’ve heard tell that this might actually be a future holiday offering by Theatre Unbound. I can’t think of a more appropriate way to honor their mission - or complicated holiday family time - than A Gertrude Stein Christmas. Meanwhile, get your head out of summer for an hour and enjoy a very Fringey sort of Christmas.